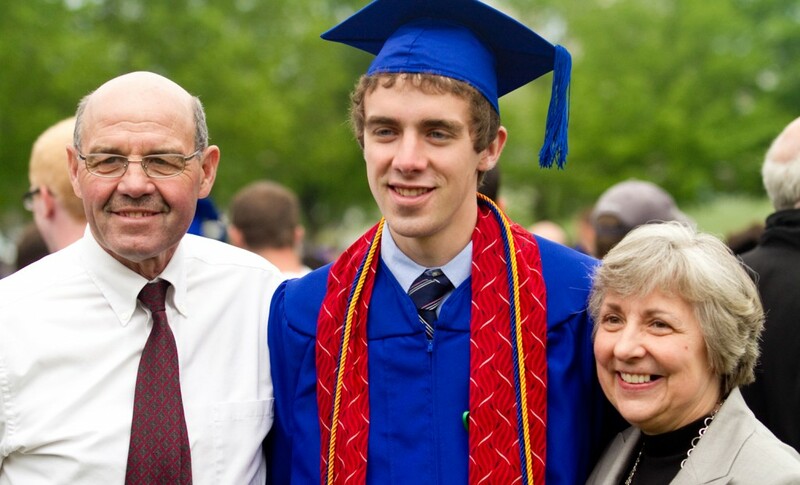 Michael Spory (center), a 2011 EMU graduate and cords of distinction recipient, was one of 16 students nationwide accepted into the Lilly Graduate Fellows Program operated by Valparaiso University, and will attend Iowa State University in the fall of 2012. Pictured with Spory are parents, Melvin and Cathy Spory. Photo by Jon Styer. Michael Spory, a 2011 Eastern Mennonite University (EMU) graduate, was one of 16 students nationwide accepted into Lilly Graduate Fellows Program through Christ College, an interdisciplinary honors college at Valparaiso University. Spory, who graduated from EMU with degrees in photography and art, will enroll in a dual degree master of architecture and master of community and regional planning program at the College of Design at Iowa State University in the fall of 2012. “Although I am still very new to the field, I am interested in looking at design as a tool for economic and community development, rural architecture, and international and socially conscious environmental design,” Spory said. Spory was selected from among 61 students nominated from the 95 schools that are members of the Lilly Fellows Program National Network of church-related colleges and universities. As a Lilly Fellow, Spory will attend four conferences over the next three years to collaborate with other fellows, senior scholars and luminaries who integrate research, teaching, vocation and an interest in church-related higher education. He will receive three annual $3,000 stipends for use as needed. The current program will end in the fall of 2015, with the graduate fellows being introduced to representatives of the Lilly Fellows Program National Network at the network’s annual national conference. While at EMU, Spory was co-president of the Student Government Association for two years and was involved in music and theater. He was also an intern with EMU’s marketing and communications department. He was a recipient of one of EMU’s highest awards, the “cords of distinction” as a graduating senior. A native of Boswell, Pennsylvania, Spory has been a marketing and sales associate with MennoMedia since June 2011. He attends Zion Mennonite Church in Broadway.